The service is quick and friendly. I would have liked if our server could have told us a bit more about what was on draft (we sent her back to the bar with questions at least three times), but because she seemed fairly young, I can’t imagine that she’s been able to get a whole lot of firsthand experience with the beers on tap. 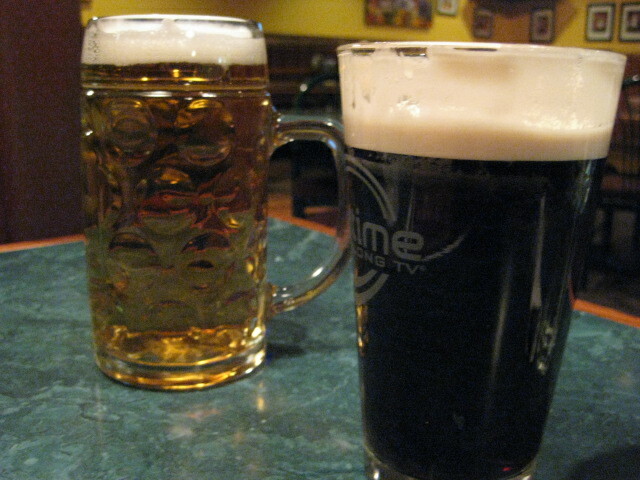 I ordered a Guinness and Wes ordered the Houfbrau, a surprising and welcome addition to a pretty so-so draft list. Since our server seemed willing to put down bread basket after bread basket after bread basket, I skipped on an appetizer. 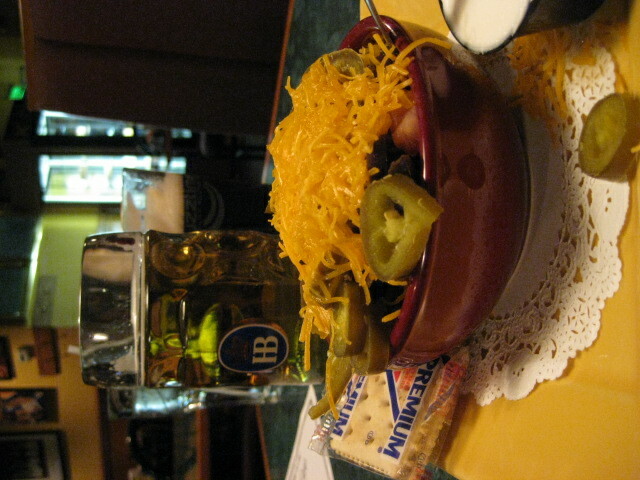 Wes went for the chili, which was served piled high with jalapenos and shredded cheese and accompanied by sour cream. How you like your chili depends on a few key factors: do you like it a little wet or dry? A little sweet or very spicy (or both)? Getaway’s chili was very chunky, a little pot of emphasized ingredients loosely united with chili spice, but it lacked the cohesive ties that bind a really good chili together. This was definitely a cut above the normal diner chili, but it needed just a tad more broth to bring it all together. I was pleased with the amount of vegetarian options on Getaway Cafe’s menu. As standard as the offerings are, it’s nice to see a bar-restaurant extend the menu beyond the normal pub food. 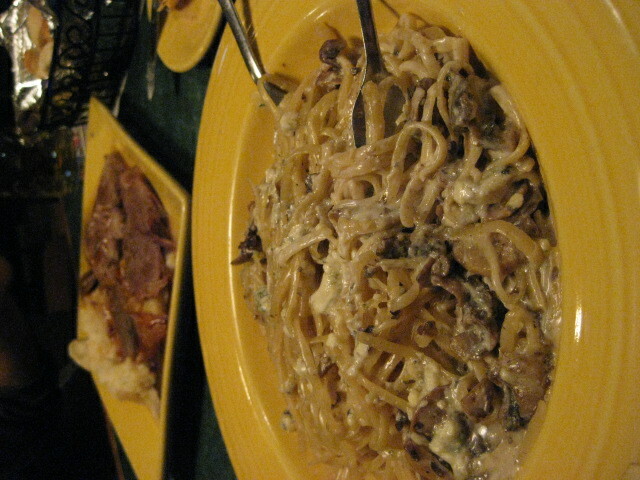 I was in the mood for hearty pasta, but not necessarily for meat, so I went for the Portobello & Gorgonzola pasta. It was a dish better in theory than in practice. While the gorgonzola provided a nice bite in addition to the creaminess, the Portobello slices were overwhelmed by the flavor of the cheese. Aside from a little extra protein and a mildly unpleasant textural sliminess, the mushrooms added very little to a dish that would have benefitted greatly from texture and flavor distinctions. Cut back the cheese and add some spinach, asparagus, and sun-dried tomatoes, and you’d have a winner. As it was, it was too heavy and hit too one-note on the flavor. Wes didn’t fare much better with his choice, a plate of Yankee Pot Roast. The meat was very fatty, and the braising sauce didn’t provide as much flavor as the dish required. Again, the problem seems to be the only essential ingredients nature of the dish. Not all plates should be piled with various elements, but again, a little bit of textural and flavor variety would have improved this meal tremendously. 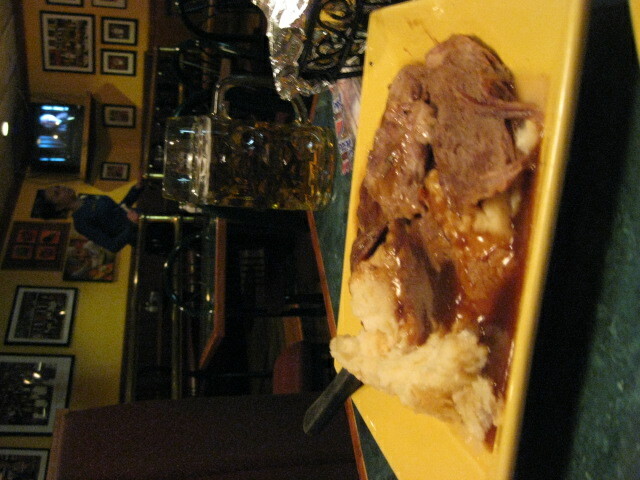 The meat was nicely tender, but too bland to make up the flavor for the mashed potatoes. We were both a little dissatisfied. 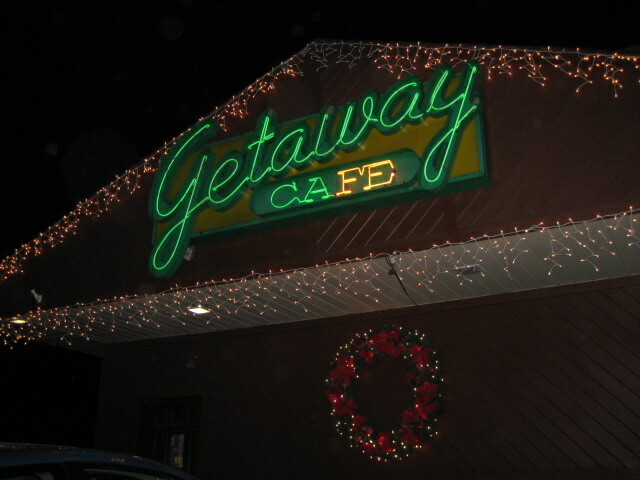 Getaway Cafe isn’t what you would consider significantly pricey, but the cost-to-quality ratio was definitely off. Just the fact that we were actively considering the prices on our entrees indicates the quality of the food we received. I’m normally of the mind that a well prepared dinner costs what it costs, and you don’t go dining out to save money but to get an experience that you’re not likely to get in your own kitchen. Nevertheless, price point should indicate a certain meal quality. The experience, however, was not all bad. Despite our displeasure with the food, we were treated excellently. Our server was friendly and talkative, and the general atmosphere was relaxed and lively. Because we could chat comfortably, we stayed seated in our booth long after the plates were cleared. The extensive Getaway Cafe menu leads me to believe that the problem might not be in the quality of the restaurant’s chefs, but in the over-extension of the menu’s offerings, in which case, a little pruning could go a long way. If that ever does happen, I wouldn’t mind taking another visit, especially if it was in the warmer months when we could take advantage of the patio dining. This entry was posted in Dining Out, Dinnertime!, Food and tagged American, bar, beer, chili, dining out, dinner, food, Getaway Cafe, guinness, pasta, pittsburgh, Restaurant, restaurant review, south hills, south hills dining, vegetarian, yankee pot roast. Bookmark the permalink. This is probably the best gem in South Pittsburgh. I grew up going here and am still very pleased with the food. I’d rather go to the Getway than a Friday’s any day! I have a feeling it takes a lot to make you and Wes happy. I could give you a million in cash and you would complain about the denominations.